Deep Imapact comet Prophecy Bible Code! This Bible Code is found in Isaiah 45:2-5. The purpose of these series of articles that detail the rhyme and reason for when these events (including events surrounding Saddam Hussein from the time that the Twin Towers fell) is to demonstrate that God has everything timed. It is to prove that God alone can predict things like a storm years in advance. He alone is God! Dan 9:26 "And after the sixty-two weeks shall Messiah be cut off, and shall have nothing; and the people of the prince that shall come shall destroy the city and the sanctuary; and the end thereof shall be with an overflow (flood), and unto the end, war, --the desolations determined." Dan 12:4, 9 And thou, Daniel, close the words, and seal the book, till the time of the end. Many shall run to and fro, and knowledge shall be increased. ... And he said, Go thy way, Daniel; for these words are closed and sealed till the time of the end. Interestingly, the comets name was Tempel and the moth-code is also the same as the Temple Picture Bible Code. Cyrus was prophesied to rebuild God's temple in Jerusalem in Isaiah 44:28. Since plays-on-words are common in the bible, I believe that comet tempel is also a prophetic play on words for temple. The seven woes of the Genesis Creation Code are similar to the woes found in the book of Revelation that are being announced from God's temple in heaven. 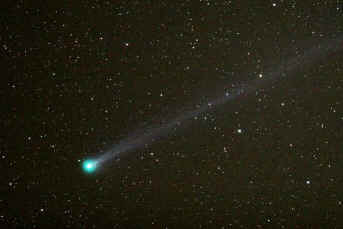 In that passage we read about a comet or star striking the earth with a very deep impact. "And I saw, and I heard an eagle (or angel), flying in mid heaven, saying with a great voice, Woe, woe, woe, for them that dwell on the earth, by reason of the other voices of the trumpet of the three angels, who are yet to sound. And the fifth angel sounded, and I saw a star from heaven fallen unto the earth: and there was given to him the key of the pit of the abyss. And he opened the pit of the abyss; and there went up a smoke out of the pit, as the smoke of a great furnace; and the sun and the air were darkened by reason of the smoke of the pit," (Revelation 8:13-9:2). Deep Impact is thus a sign of this woe that is yet to come, about which men will vainly try to stop. Currently, NASA is waiting for the smoke to clear so that they can peer into the pit they made on the face of their star/comet! "Deep Impact" is the name given to the space project seven years ago, and coincidentally it has the same name as a movie put out also at that time. It was about an attempt to stop a comet from striking the earth. (The film is unfit to watch due to swearing.) The Deep Impact project to comet Tempel also hopes to give scientists understanding of how better to deflect any future cataclysmic strike by a meteorite (comet) against the earth. The primary said objective is to find out the origins of the universe, and this is why the project is such an affront to the Creator! "Who is the Creator?" is the theme of the bible code. Is the Creator a mere hunk of rock or is it the living God. 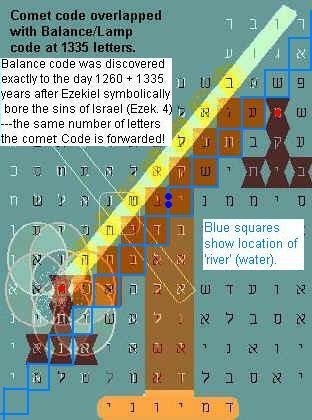 This again compares to the Balance Bible Code which is encoded one chapter later in the book of Isaiah. That code mocked the failed attempt to know our origins from studying space dust when the space craft called, "The Genesis Project", plummeted to the earth. 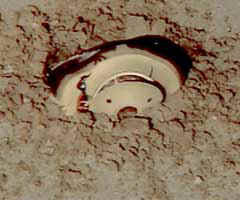 The stunning fall of the Genesis craft (right) is a sign of the fall of Lucifer, "the guardian cherub," (Ezek. 28), about which that earlier code (left) alluded. The bible code speaks about a "rich man" and king "Cyrus." By reading the bible passage where it is encoded should answer such questions by themselves. (See context of the code.) Amazingly, the pagan Cyrus is a type of the Messiah Jesus who shall rule over the kingdoms of this world and restore to His people their inheritance. Cyrus the Persian conquered Babylon on the occasion of the writing on the wall, when God wrote, "Mene, mene, tekel, uparsin!" The bible code is careful to explain that Jesus is only like Cyrus in certain things, but not in everything (of course). In effect, the people of God cross the river along the balance to the other side during this 75-day/letter interval. God's people are passed from death to life and do not suffer the wrath of God. However, at what point we are taken up out of this world is intentionally vague in bible prophecy. 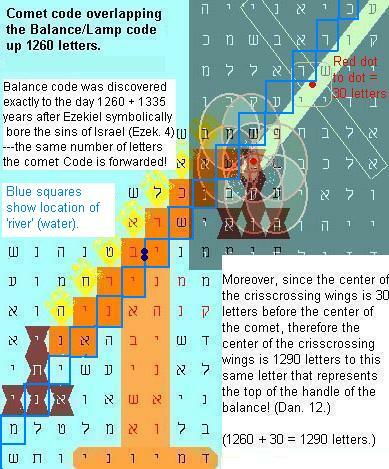 (This bible code will not be understood without studying the text in which it is encoded. It may otherwise sound irreverent. Jesus Himself once asked, "Who do men say that I am?" And, "Then Jesus spoke to the crowd, "Did you have to come with swords and clubs to capture me, as though I were an outlaw? Every day I sat down and taught in the Temple, and you did not arrest me," (Matt. 26:55, GNB). The name of Jesus means, "Jehovah (The Lord) saves!" The bible code is declaring that Jesus is Jehovah, and no mere great man (Cyrus) or angel (cherub), and that as Creator He does no wrong, but has redeemed by His blood all that turn to Him and makes the same sevenfold confession as in the code. However, the implication is that both Cyrus and angels nevertheless still typify and symbolize Him---"The Righteous Prince." Who is Jesus, a rebel!?! Who are you, my enemy? O my enemy, where did He die? Is my Maker (merely) like a rich man or even like a great cherub?! My Perfect One is Jesus! Who is My Great One? 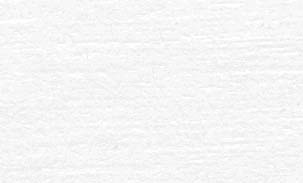 Where each line of text is located in the image. Who is Jesus? You rebel! Who is My Great One? (Left wing along left side of wing. For , see Hoses 5:13; 10:6. Note: There is more to this code, but that is all the time I intend to spend on decoding it. The basic message is there, that is sufficient. 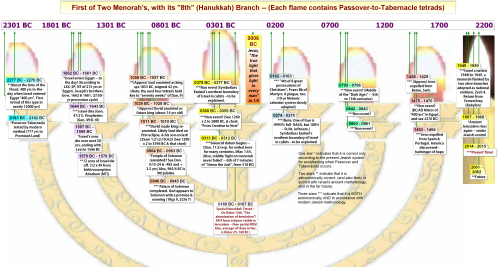 The dark red is where the bible code is found. Isa 44:28 That saith of Cyrus, He is my shepherd, and shall perform all my pleasure, even saying of Jerusalem, She shall be built; and of the temple, Thy foundation shall be laid. Isa 45:3 and I will give thee the treasures of darkness, and hidden riches of secret places, that thou mayest know that it is I, Jehovah, who call thee by thy name, even the God of Israel. Isa 45:7 I form the light, and create darkness; I make peace, and create evil. I am Jehovah, that doeth all these things. Isa 45:8 Distil, ye heavens, from above, and let the skies pour down righteousness: let the earth open, that it may bring forth salvation ["salvation," here, is same as name "Jesus"], and let it cause righteousness to spring up together; I, Jehovah, have created it. Isa 45:10 Woe unto him that saith unto a father, What begettest thou? or to a woman, With what travailest thou? Isa 45:11 Thus saith Jehovah, the Holy One of Israel, and his Maker: Ask me of the things that are to come; concerning my sons, and concerning the work of my hands, command ye me. Isa 45:13 I have raised him up in righteousness, and I will make straight all his ways: he shall build my city, and he shall let my exiles go free, not for price nor reward, saith Jehovah of hosts. (See Epilogue: After Hurricane Dennis and "Our Rock"
Not counting the sign of "Deep Impact" (see below), that makes 12 comets/stars within this 3.5-year period! Recall the 12 sons of Jacob and Jacob's Bible Prophecy Acrostic upon which our study is founded, and recall the 3.5 years (1260/1290 days) in Rev. 12 (and Dan. 12), and the "12 stars" described there! 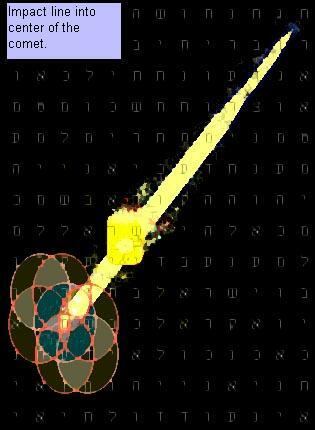 #?, Comet Tempel "Deep Impact"
NASA launched a space craft of "Deep-impact" and hit a small impactor moduleagainst the nucleus of comet (in Virgo) successfully on July 4, 2005, as foretold in the bible code a year earlier! 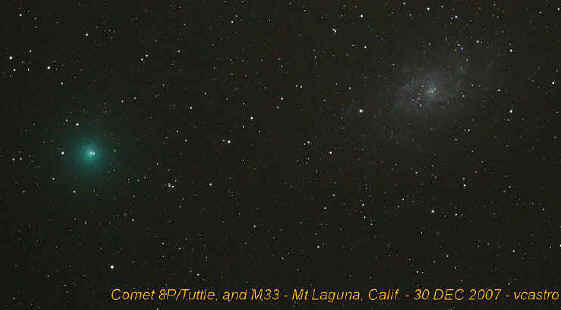 An interesting and fragmented comet. The brightest fragment peaked at mag. 5.1 on May 11. 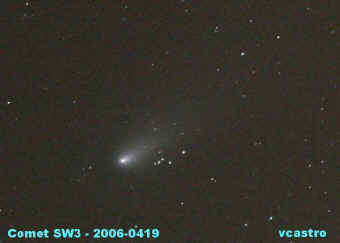 The comet was being a naked eye comet in May 2006 close to the Earth about 11 millions kilometers. 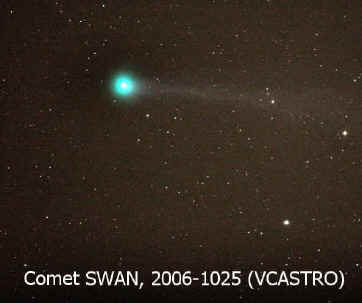 Comet Loneos obtained a brightness of the 5th magnitude around October 28, 2007, but was also just visible to the naked eye up to about a week earlier (in the constellation of Bootes). 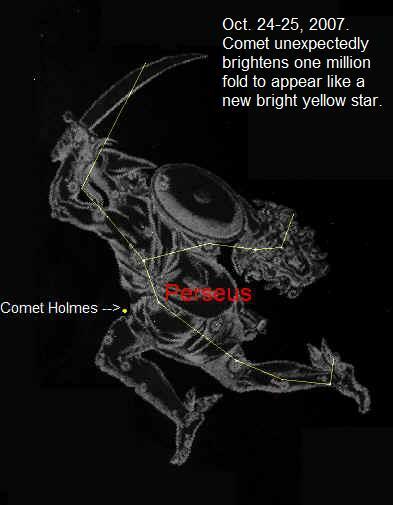 This puts comet Loneos just days before and cotemporaneous with comet Holmes in our numbering of comets one to twelve. 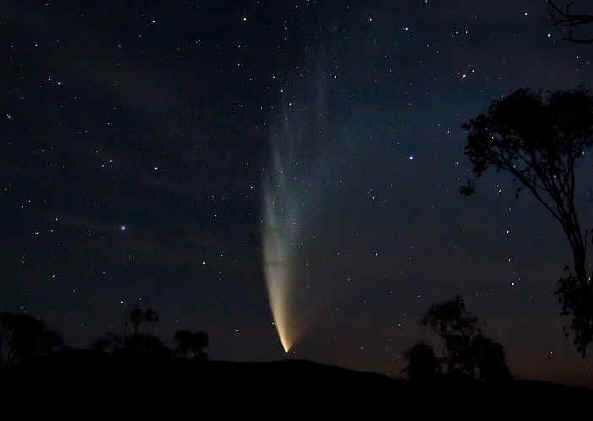 This means that the 12 comets began and ended with two or three comets visible in the sky at the same time. Another example of overlapping of images.